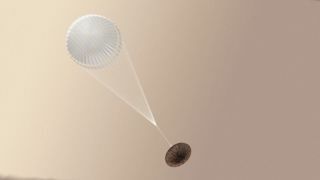 Artist's illustration of the European Space Agency's Schiaparelli Mars lander parachuting down to the surface during its descent on Oct. 19, 2016. The ExoMars 2016 mission gets a solid "A" thus far despite the failure of its Schiaparelli lander to touch down softly on the Red Planet, European Space Agency (ESA) officials said. Schiaparelli stopped communicating with its handlers less than a minute before its planned touchdown Wednesday morning (Oct. 21). While ExoMars team members are still analyzing the lander's data, early indications suggest that Schiaparelli fired its thrusters for an insufficient amount of time toward the end of the descent and slammed into the Martian surface hard — an interpretation bolstered by photos of the apparent crash site taken by NASA's Mars Reconnaissance Orbiter. And Schiaparelli — also known as the entry, descent and landing demonstrator module (EDM) — did manage to return data during the first 5 minutes of its "6 minutes of terror" landing attempt. This information should aid the landing-system design for the life-hunting ExoMars rover, which is scheduled to launch toward the Red Planet in 2020, ESA officials said. "The importance of TGO and EDM can be described as 80 percent versus 20 percent, respectively. Since we obtained at least 80 percent of the data during the descent, the overall success rate can be calculated as follows: 80+20*0.8 = 96 percent. All in all, a very positive result," ESA Director General Jan Woerner wrote in a blog post today (Oct. 21). "So, to sum up where we stand: We have achieved a successful orbit insertion of TGO, ready to perform science and act as a relay station for ExoMars 2020 ground science," Woerner added. "Not only that, but we have received a large quantity of data from the lander, giving us crucial information to help us perform a successful landing of the next mission." TGO's main science mission involves helping pin down the source of methane and other low-abundance "trace gases" in the Martian atmosphere. Methane is of particular interest to astrobiologists; living organisms generate most of Earth's atmospheric methane (though geological processes can produce the gas as well). TGO is currently in a highly elliptical, four-day orbit of Mars. Early next year, the spacecraft will begin shifting to its final science orbit, a circular path with an altitude of 250 miles (400 kilometers). TGO should reach this orbit in March 2018 and officially begin the craft's two-year science mission shortly thereafter. ESA leads the two-part ExoMars mission, with assistance from its main partner, the Russian federal space agency, Roscosmos. To date, NASA is the only entity to mount a fully successful mission to the Martian surface. The American space agency is currently riding a streak of four consecutive such successes: the Spirit and Opportunity rovers in 2004, the Phoenix lander in 2008, and Curiosity, which touched down in August 2012. "Landing a spacecraft on Mars is extremely challenging," Jim Green, director of the Planetary Science Division at NASA Headquarters in Washington, D.C., said in a statement. "We admire the initiative and development of the teams that worked on the Schiaparelli lander that was part of the ExoMars mission. International collaborations, as well as future work with private industry, remain crucial elements of the journey to Mars and beyond."